Eye bags at the age of 19 are they from my genes or lack of sleep by Dr. Philip Young of Aesthetic Facial Plastic Surgery: Eye bags are based on some genetics but most people have some element of it. I wouldn’t blame mother. Eye bags, Eye dark circles happen to almost everyone and it starts in the 20’s and 20’s. The cause is mostly the volume loss under your eyelid fat. The eyelid fat doesn’t get metabolized by the body and thus looks like it has grown. But it really is a loss of volume underneath it that accentuates it. Traditionally, people tended to remove the eyelid bags. This was not really treating the cause of what made them appear. The more natural way is to fill the volume loss. The options temporarily include fillers like restylane, perlane, juvederm. Long term options include fat injections, the young vitalizer, implants in this area. Because you haven’t had anything done I would start with fillers before moving on to more longer lasting options. A lack of sleep can accentuate the condition. But mostly it is an issue of aging. 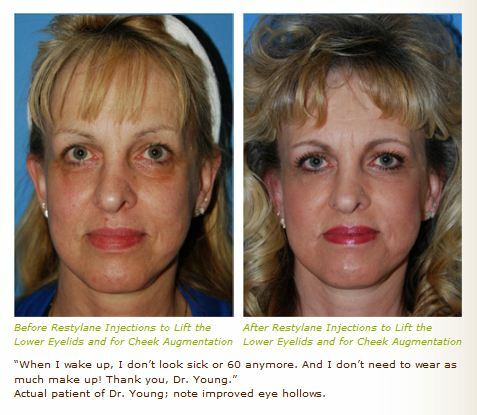 The YoungVitalizer is another great option for lower eyelid bags and the one that I prefer. persistent furrows between eyes, asymmetry in eyes, cockeyed appearance and persistent lower eyelid bags? 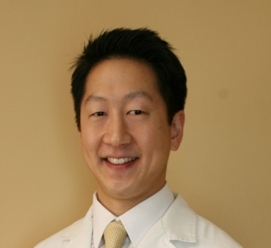 Persistent furrows between eyes, asymmetry in eyes, cockeyed appearance and persistent lower eyelid bags by Dr. Philip Young? The asymmetry in your eyes could be due to swelling that is still from surgery. How long has it been since the surgery? Swelling can last a couple of months. Most of it goes away in a week and more so after a month. The lower eye lift is supposed to remove fat from your eyelids. Sometimes though this can accentuate the hollowing in the lower eyelid area and make you look even older here. Wrinkles in your forehead can be improved by a brow lift by raising the eyebrows and negating the need to open up your eyelids and eyebrows more. Also removing muscle in between your eyes can really help prevent the vertical lines in between your eyebrows and eyes. Fat injections in the lower eyelid and forehead and upper third of the face can really bring youth to your face. Posted in Blepharoplasty / Eyelift / Eye Lift / Dark Circles / Eye Bags, Browlift / Eyebrow Lift / Brow Lift | Comments Off on persistent furrows between eyes, asymmetry in eyes, cockeyed appearance and persistent lower eyelid bags? I’m european and have low eyebrows and puffy eyelids. Would a brow lift be something for me? I’m european and have low eyebrows and puffy eyelids. 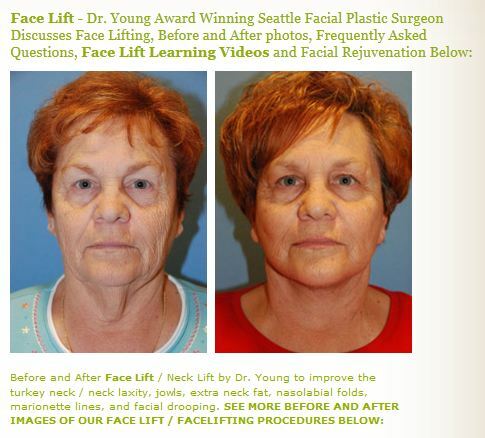 Would a brow lift be something for me by of Dr. Philip Young Bellevue | Seattle: I see that you may have some fullness in the upper eyelid area. This is actually something that gives you youth and that is something to think about. Your eyebrows may be a little low but not worth the extent of a browlift. A browlift could feminize you and create more of a surprised look for you. I think if you were to consider something, I would suggest taking some skin from your upper eyelid or actually creating a crease as in Asian eyelid surgery. This could define your upper eyelids more. Your situation is something that Asian people inquire about all the time. A crease could decrease the puffiness you have to a controlled degree without lifting your eyebrows to a surprised and more feminine appearance. Posted in Asian Cosmetic Surgery, Asian Double Eyelid Surgery / Asian Eyelid Surgery, Blepharoplasty / Eyelift / Eye Lift / Dark Circles / Eye Bags | Comments Off on I’m european and have low eyebrows and puffy eyelids. Would a brow lift be something for me? 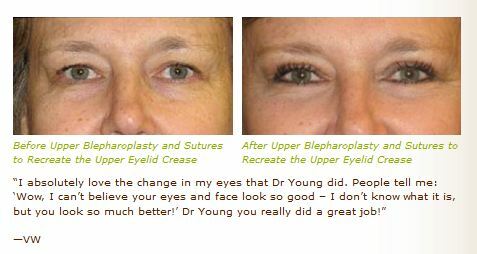 Brow lift for an attractive lady who feels she has a sad look or sad eyes. Would a temple lift or brow lift work? You are an attractive pretty lady. I can see why, though, you would possibly think that you have sad eyes. One I think that your eyebrow may be a little low but not extremely low. A browlift may help you brighten up the face / image and your eyes. One technique that could help you is if you thinned your eyebrows through judicious brow waxing and hair plucking. Also lightening your eyebrows could help. But a brow lift could increase this distance and make your eyes look softer. The distance between your eyelid margin and eye brows should be around 1 iris width and not much more than 1 1/2 iris widths. A temple lift would concentrate on your lateral portion of your eyebrow. A brow lift would be the whole eyebrow lifted. In my opinion, I think you need the medial part of your eyebrow lifted as much as your lateral part of your eyebrow, if not more. I would do a brow lift and not just a temple lift. Posted in Blepharoplasty / Eyelift / Eye Lift / Dark Circles / Eye Bags, Browlift / Eyebrow Lift / Brow Lift | Comments Off on Brow lift for an attractive lady who feels she has a sad look or sad eyes. Would a temple lift or brow lift work? My eyes are set high and my eyebrows are closer to my eyes. What can be done? My eyes are set high and my eyebrows are closer to my eyes. What can be done? by Dr. Philip Young: Low set eyebrows and not high set eyes could possibly be the status and a browlift could help / improve your situation. Without a image, it would be really difficult for me to know what you are talking about. Most simply, I have a theory on facial beauty that might help you understand your facial aesthetics better. I would suggest that you read that seminal paper. But if your eyebrows are a little closer to your eyes, a brow lift could be the simplest answer for you. This will create some separation from your eyes and your eyebrow. Ideally this distance is around one iris width from your eyelid margin to the bottom of your eyebrow. Much more than this distance will give you a surprised look. Much less than an iris width will give you a stern look. Follow this link to see our Brow Lift Before and After Images. Posted in Blepharoplasty / Eyelift / Eye Lift / Dark Circles / Eye Bags, Browlift / Eyebrow Lift / Brow Lift, My Journey to Find and Attain Beauty | Comments Off on My eyes are set high and my eyebrows are closer to my eyes. What can be done?